In the Spring of 2003, there was ample coverage of the animosity felt between Americans and the French over the Iraq War in The International Herald Tribune. Manifestations on the streets of Paris were not unusual; one of the more memorable “manifs” was grand marshaled by an individual in a skeleton costume burning an effigy of George W. Bush. On more than one occasion, complete strangers in French cafés recognizing my American accent would ask me if I had seen Michael Moore’s Fahrenheit 9-11 and what I had thought about it. Conversely, I heard reports from back home about talk of a boycott on French wines, parties where individuals dumped their perfectly aged, liquid investments into the rivers for the media to see. Freedom fries, instead of french fries were served in American cafeterias. The French were protesting the unilateral waging of a war without international support in a global community, and jumpy Americans, still licking their bleeding wounds sustained in the massive attacks of September 11th were slowly starting to understand just how successful that attack was, terrified and debilitatingly imagining weapons of mass destruction bound for their borders, believed to be cleverly hidden under Saddam Hussein’s stolen Kurdish tribal rugs. Other than an incident of my son’s baseball cap, a casquette, that was stolen off his head, cursed with an epithet reserved for we Yanks, and thrown into the garbage in the cour of the école maternelle, we survived unscathed. Startled by the intensity of the demonstrations on the street, perhaps, by their boisterous and loud presence, we simply understood them to be a culturally genetic trait of a society formed at the broken ramparts of the Bastille. Vive la France! No offense taken. Many a sympathetic American would have take up banners beside you. We just weren’t among them. It was not long after that my parents came to visit and see how their grandchildren were faring in the Land of Gaul amongst all this perceived animosity. A military history buff wanting to see the beaches of Normandy and the museum in Caen, my father would often enliven our dinnertime conversations with the inevitable present day politics, but also that of the past. We once enjoyed a very tight American – French alliance, one that was integral to our formation as a nation.He told a terrific story about the World War I Commander-In-Chief of the American Expeditionary Force, General John J. Pershing, who later went on to serve as the Army Chief of staff and author a Pulitzer Prize winning autobiography. Pershing was called to duty after the Americans declared war against Germany, arriving at a time when American presence was a much-needed lift to the French psyche, which had understandably suffered a fierce blow embattled in the trenches for three years, suffering innumerable casualties. On July 4, 1917, the city of Paris amiably and with honor celebrated the Day of American Independence, featuring a parade which concluded at the Picpus cemetery. Pershing was to lay a wreath at the grave of the Marquis de Lafayette, but not being fluent in French, asked Lt Colonel Charles M. Stanton make the brief remarks. 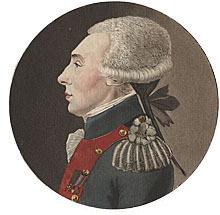 He reputedly said upon facing Lafayette’s grave, “Monsier le Marquis de Lafayette, nous sommes arrivées!” They had come as Patriots to endeavor to chink away at the enormous debt of gratitude that we as a nation owed Lafayette by aiding France in arms against Germany. 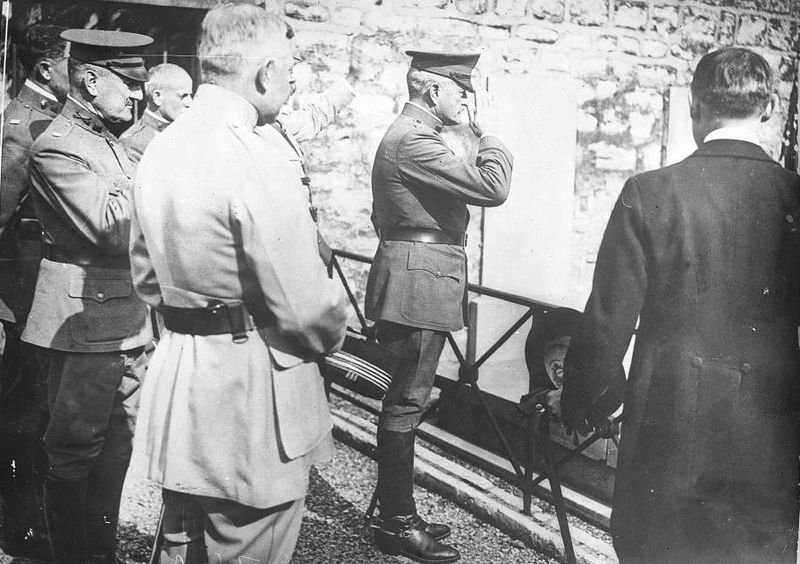 General John J. Pershing saluting the tomb of the Marquis de Lafayette, Cimetière de Picpus, Paris, July 4, 1917. The debt was huge. Most Americans know that Le Marquis de Lafayette was 19 years old when he came to America in 1777 to take the post of General George Washington’s aide-de-camp. Most can report that the French gave financial support to a fledgling America not-yet-born, a gesture that was invaluable to our success in forming a new nation. We simply would not have won the war for independence without their support. What many don’t know about Lafayette was that he was an Idealist, a military mind who believed so deeply in the cause of American Independence that he actually had to find passage via Spain to get to America, as the French monarchal support had not yet been garnered, putting himself at great personal risk. Because British spies were paying close attention, he had to disguise himself as a woman. Because the cargo ship was bound for a trading stop in the West Indes, he bought all the cargo in the hold to avoid stopping and eliminate the risk of discovery. He fought ably and with distinction against the British on American soil for no pay for years. Yes, he was an aristocrat, but he actually helped fund the cause with $200,000 of his own fortune, paying the salaries of many military hands. During the two year hiatus (1778 – 1780) he spent in France during the war, he helped Benjamin Franklin lobby King Louis XVI for more financial support, supplies and men to be sent to America. I dare say that with no Marquis de Lafayette, there may not have been a United States of America. Incidentally, while browsing an antique book fair in the Place Saint Sulpice in Paris, I came across the first map ever printed of the New World, referring to that eastern chunk of North America as “Les États-Unis d’Amerique.” The book seller told me that it was the first ever printed with our new country’s proper name, and it was optimistically printed before we actually won the war. Merci beaucoup pour votre confiance, nos amis! Chez George has long since been torn down, too, but the plaque commemorating the events is embedded into a boulder in front of a Dutch Colonial that was built some 150 years later. Interestingly, “Ripley’s Believe it Or Not” once listed it as The World’s Smallest Park, a coveted title now bestowed on Snow Park in Tampa, Florida. Ironically, Snow Park is located on Kennedy Boulevard, a rue that was formerly known as Lafayette Street. Lafayette went on to have four children, two of which are named for his very personal American friends, cementing and indelibly marking his great fondness not only for the individuals, but the ideals they represent: Georges Washington Lafayette and Virginie Lafayette, after the home state of Thomas Jefferson. He even has two barrels full of Boston’s Bunker Hill soil on that grave of his in the Cimitière de Picpus in Paris, fulfilling his wish to be buried on American soil. So I, in the interests of Patriotism and love for the Marquis, kept the fleeting politics of 2003 out of my better opinions, understanding that the same society that burns effigies can produce the most brilliant and loyal idealists. I am proud that if even for just a brief time, Lafayette called Montclair, New Jersey “headquarters” for the cause that so inspired this great Frenchman, and great American. For Lafayette was made an honorary United States Citizen posthumously by Congress in 2002, one of only seven in our country’s history, and one year before Georges Dubya sent troops to Iraq.